Welcome to The Bentley Student Experience, the third and final Centennial year exhibit detailing the history of Bentley University. Bentley was founded in response to a demand for more highly educated business professionals –especially accountants – in the first decades of the twentieth century. At this same point in the development of American higher education, what we now know as Student Affairs (a set of co-curricular offerings created and managed by educational specialists) began to emerge. Student Affairs at Bentley evolved as they did at colleges and universities across the country, though perhaps a bit more slowly as a result of Bentley’s status as an urban, “street-car school” that offered the basics to students. Once Bentley relocated to its spacious Waltham campus, the student experience steadily began to resemble that of a traditional residential college. The student experience at Bentley also reflects the distinctive philosophy that characterizes this institution in so many ways – a philosophy that embraces founder Harry Bentley’s belief in a real-world education. In the 21st century we talk about engagement, and Bentley prepares students to have full lives and careers by engaging them in innovative ways now, in the life of the campus and beyond. The Bentley Student Experience exhibit is not limited to student life narrowly defined as activities and clubs; but is intended to showcase all aspects of what has contributed to being a student at Bentley for the past century – in the classroom, in the residence halls, commuting by streetcar or on Route 128, playing a sport, serving the community, meeting someone with a drastically different background, and more. Today, fostering an engaged student experience is a key element of the university’s strategic direction, one that recognizes the educational value of comprehensive growth in and out of the classroom. Please enjoy this look at the way students have experienced Bentley for 100 years. Life has changed greatly for Bentley students over the last 100 years. From when their school was founded in 1917 until Bentley moved to Waltham in 1968, the institution was known as “a poor boys’ school” because most of its students were working-class young white men from Massachusetts who commuted and studied in the evening to master a skill (namely accounting) that would enable them to move upward in the world. Bentley students still strive to succeed, but their school is much more diverse than it used to be. After moving to Waltham, Bentley began to appeal vigorously to female and minority students, as well as to national and international students. Like Bentley men of old, many of the school’s modern-day students aspire to become accountants. But most students at the university pursue non-accounting majors, and they study in the daytime because their school is now mainly a residential day institution. Students walk outside 921 Boylston Street in 1964. Before the move to Waltham, Bentley was primarily a commuter school. Though many students now live on campus, there are still large numbers of commuters whose needs are represented by the Commuter Association. In its early years, Bentley had no dorms at all and most of its students lived at home or in rooming houses. Out-of-state students were able to live in a couple of dorms that Bentley rented, but the school did not acquire its own dorm until 1960 when it bought 373 Commonwealth Avenue from Emerson College in Boston. 373 Comm Ave. was a men’s dorm with a strict dress code, and no women—not even mothers—were allowed above the first floor. After enrolling at Bentley, women students wanted their own dorm, and they got one when the college moved from Boston to Waltham in 1968. Female freshmen were assigned in that year to Stratton House, while male freshmen were assigned to the Tree Dorms. Upperclass students had to find their own accommodations until the Adamian years (1970-1991), when Bentley embarked on a dorm-building spree that enabled nearly all of its undergraduate day students to live on campus. Students read books and magazines in a common room of the dormitory at 373 Commonwealth Avenue, part of the Boston campus, ca. 1950s. Students sit in a dorm room on the new Waltham campus, 1969. A student moves into a dorm, carrying all that he can, on the new Waltham campus, 1969. A typical dorm room on the Waltham campus, ca. early 1970s. A tour guide waits to give dormitory tours, possibly during Reunion. The original Observatory can be seen in the background, on the site that would soon become the Adamian Academic Center. During its first 40 years, Bentley did not have any centralized dining services. Students who lived in fraternity or boarding houses were often served meals by a house matron. Commuter students, and anyone in need of midday grub, found regular lunch spots in Boston’s Back Bay. Some early favorites were the Honey Donut Shop and the Hayes-Bickford Restaurant. As the school prepared for accreditation, it became clear that dining services would need to expand. So, in 1959, the first cafeteria opened in the renovated 867 Boylston Street building. On the Waltham campus, dining options have changed with the times. In the 1970s, places like the Falcon’s Nest Coffeehouse and the Rathskeller Pub (both located in what is now LaCava) became popular thanks to their specialty menus and live entertainment. However, a glut of carb-based options for dinner eventually led to a “Pasta Protest” in 1971! Today, students have a number of dining options (pasta included) all across campus. A student eats at the cafeteria, ca. 1970s. Lounge and dining area in original Lindsay Hall at 867 Boylston Street on the Boston campus, ca. early 1960s. Students in line to purchase food at the campus café in the lower level of the LaCava Center, ca. 1980s. This 1971 article from the campus newspaper profiles the student-run Falcon’s Nest Coffeehouse. Located in what is now the LaCava Center, the Falcon’s Nest was famous around campus for its live entertainment and interesting food options. Today, the Bentley student experience involves high-tech classrooms, personal computers, cloud storage, and more. In 1918, and through many of the early decades at Bentley, the experience was much different. On Boylston Street, classroom technology included chalkboards, mechanical calculators, and overhead projectors. A “Machine Room” was established to train students to use adding machines, then an essential piece of accounting equipment. In class, students kept track of important figures and calculations with large ledger books. Throughout the years, Bentley administrators kept a close eye on developing technologies. The school installed its first mainframe computer in 1969, although Computing Science courses had been offered since the 1950s. By the 1980s, our now famous laptop distribution program got its start. Today, the classroom experience includes laptops, smart boards, high-tech labs, and more. Students pay attention to a lesson in a classroom on the Boston campus, ca. 1950s. Bentley students attend class in Room 100 of the 921 Boylston Street Building, ca. early 1950s. Crowding in this and other classrooms prompted Bentley to expand its facilities, first in Boston and then to Waltham. 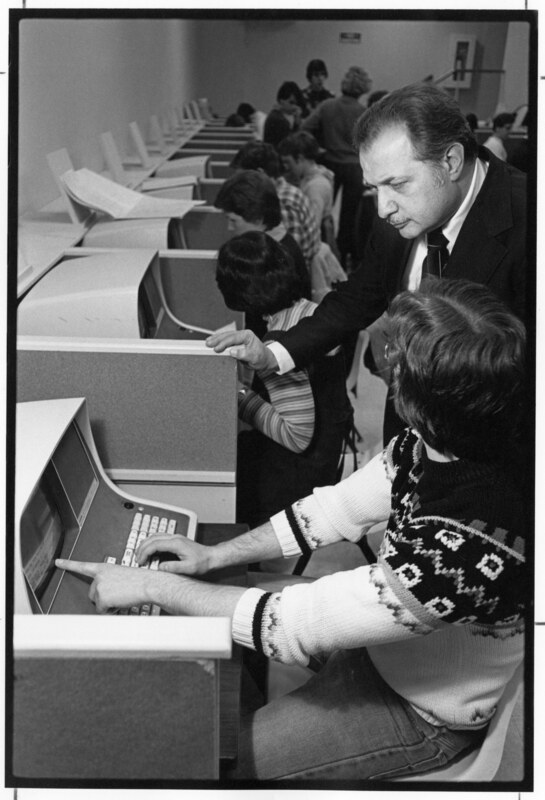 A student works on a computer as President Gregory Adamian looks on, ca. 1982. President Adamian was a strong supporter of the development of technology on campus and in academic programs. A student studies diligently in the library, 1982. A student, possibly in a Continuing Education class, listens attentively to a lesson, ca. 1980s. Students cheer on Bentley in the stands at a school sporting event. Student Kevin McLaughlin performs with at the 1970 Talent Show. The annual Talent Show began in 1964 and became an important event on campus, especially since it was a fundraiser for the senior class and everyone wanted to win the coveted Beaver Bowl! Students play volleyball on campus on a sunny day, ca. 1970s. Social life for students at Bentley is much more plentiful than it used to be. Back when the school was in Boston, most of its students were commuters who did not participate in on-campus activities. Rather than hanging out at Bentley (which did not have a cafeteria or a bona fide library until 1959), the typical student tended to go home after classes, or head off to work. The school did offer some social activities, however, including dances, bowling, and a spring “Field Day” held in Brookline. Student activities proliferated at Bentley after the two-year school became a four-year institution in 1961. To be competitive with other colleges, Bentley created a varsity sports program in the 1960s and simultaneously encouraged its students to form academic and social clubs. Bentley also evolved into a residential school after its move to Waltham in 1968, and as such, it focused on the extracurricular needs of its students, building them their first gym (the Dana Center) in 1973 and providing many other recreational facilities. Greek organizations sprang up at Bentley in the 1920s, and they have been a cornerstone of social life at the school ever since. The first Greek organizations at Bentley were fraternities, and they included Kappa Pi Alpha (founded in 1922), Beta Tau Alpha (founded in 1922), Kappa Eta Sigma (founded for Jewish evening students in 1925), and the still existent Alpha Gamma Pi (founded for Jewish day students in 1926). KPA and BTA had their own houses in Brookline, although they gave them up in the World War II years because most of their members went off to fight. To survive during World War II, Bentley admitted women students in 1942, and two years later it welcomed the formation of its first sorority, Delta Omega, for female day students. A second sorority, Beta Sigma Alpha, was founded in 1956 for evening students at the school. Neither exists today, but Bentley still has many vibrant sororities and fraternities that sponsor a host of social and communal activities. Exterior of the Kappa Pi Alpha Fraternity house in Boston, once part of Bentley’s original downtown campus, ca. 1930s. Donald Janezic (left) accepts the coveted Beaver Bowl award for his fraternity, Kappa Pi Alpha, which won first prize in Bentley College’s fifth annual talent show in 1969. Members of KPA performed a skit based on the Johnny Carson Show, with Janezic playing Carson. Presenting the award is Robert Watmough, president of the Senior Class at Bentley. Click through the gallery to see photos of sororities throughout the years. The “Tub Pull”, basketball drippling from Waltham to Worcester, and a “keg roll” down the Main Street of Waltham were among the creative ways of fundraising by Greek organizations. Fraternities and sororities also hosted social events such as Monte Carlo Night and the Halloween Mixer. Today, events include the Greek Olympics and Greek Week among other social events. Click on the thumbnails to see full sized images and gallery. Greek organizations have developed a reputation for creative fundraising! In this 1972 event, members of Beta Tau Alpha dribbled a basketball from Waltham to Worcester to raise money for charity. At another 1970s fundraiser, members of Tau Kappa Epsilon held a “Tub Pull” through Waltham to raise money for St. Jude’s. This 1995 article profiles Monte Carlo Night, a casino-style fundraiser organized by TKE. The fundraiser ran annually for over 30 years and was one of the most popular events on campus. Awareness groups such as the political, cultural, spiritual, and service student organizations have always pushed the boundaries of societal thinking and opened the minds of students to different perspectives. Diversity and inclusion has been an integral part of Bentley as an institution, which is reflected in these awareness organizations available on campus. Alpha Gamma Pi, a fraternity formed by Jewish students in 1923, is not only one of the first fraternities on campus, but also one of the earliest known spiritual organizations at Bentley. The Newman Club, a Catholic student organization, formed in 1962 to support the needs of Catholic students. The Young Republican Club formed as early as 1962 and the Young Democrats started as early as 1965. As the late 1960s arrived, cultural awareness groups began to form, notably the International Relations Club in 1967 and the Black United Body in 1969. In 1989, the Bentley Gay Lesbian Alliance formed to support those of different orientations on campus. Today at Bentley, the different types of awareness groups are an essential part of student life. Events such as the Fast-A-Thon, sponsored by the Bentley Muslim Students Associations (now the Bentley Islamic Community), brings together those of all faiths and beliefs. Service organizations, such as Circle K and Habitat for Humanity, sponsor fundraising events and go off campus to help the larger community of Boston and the rest of the country. Cultural awareness groups hold events such as the Festival of Colors and the Black United Body Fashion Show to promote cultural awareness and encourage discussions on discriminatory issues. Political groups, such as the Bentley Democrats and the Bentley Republicans, bring to light the political issues of today and hold debates coinciding with elections. PRIDE, renamed from the Bentley Gay Lesbian Alliance, offers support on issues of discrimination based on orientation and puts to the forefront the inclusion of those individuals. The Newman Club, the Catholic student organization, page in 1964 yearbook. The Newman Club was the first religious student organization at Bentley. Group photo of Hillel, the Jewish student organization, in 1976. Hillel was originally founded, under the name Menorah, in 1974. Article in the Vanguard about the campus Fast-a-thon. The Bentley Muslim Student Association, now the Bentley Islamic Community, held the Fast-a-thon in 2006 to raise money for the conflict in Darfur. People of all faiths were invited to participate. Group photo of Circle K, an international collegiate service organization, in 1980 yearbook. Members of the Bentley Asian Club in their inaugural year, 1990. This was the first general cultural organization for Asian students on campus. Today, many additional groups exist based on regional or national identity. Group photo of La Cultura Latina in the 2006 yearbook. La Cultura Latina was formed in 1990 with the main purpose of educating others about Hispanic cultures. Group photo of the Black United Body (BUB) in the 1992 yearbook. The BUB formed on campus in 1969, in part to advocate for increased recruitment of black students and faculty. The group also has the distinction of holding one of the longest-running events on campus – the annual BUB Fashion Show. Article in the Vanguard in 2005 about the Festival of Colors. The Festival of Colors is held annually during the spring semester by the International Student Association (ISA) and other contributing organizations such as the Bentley Marketing Association (BMA). Activities during the Festival include a fashion show, talent show, and social events. Group photo of South Asian Student Association (SASA) in the 2012 yearbook. Group photo of the Young Republicans in the 1965 yearbook. The group formed in 1963, becoming the first political student organization on campus. In anticipation of the 2012 election, the Bentley Speech and Debate Society held a political debate between members of the Bentley Democrats and Bentley Republicans. Group photo of Bentley’s PRIDE. PRIDE was formed in 1998 and was originally established as the Gay Lesbian Alliance. One of their annual activities is a group march in the Boston Pride Parade. Group photo of the Model United Nations in 2007 yearbook. Model UN is an organization for those interested in international affairs and the United Nations. Our video playlist features footage of a Model U.N. activity in the early 1960s. The artistic and media organizations at Bentley mainly began with the Drama Club and the Bentley Journal – both beginning in the 1960s. The Drama Club eventually became Alpha Psi Omega, a national theater organization, which puts on spectacular performances of well-known productions, such as A Chorus Line and The Mouse Trap, multiple times a year. The Bentley Journal began in 1960 and changed names multiple times – Bentley News, Gadfly, Inferno – before becoming the Vanguard in February 1985. Arts organizations such as the Vanguard and the Vale, the yearbook, document the student culture and evolution of student life at Bentley. Musical and other creative outlets on campus include the Ballroom Dance Team, Craze Dance Group, Student TV, Jazz Band, and Off The Clock, an A Capella group. Students can also listen in to WBTY, the campus radio station, which has been providing enjoyable tunes since 1981. A wide variety of academic organizations offer students opportunities to supplement their education and interests. A prominent academic organization on campus is the Adamian Law Club, named after President Gregory Adamian (1970-1991), one of the most influential figures at Bentley and one devoted to the education of law. The National Association of Black Accountants (NABA), another prominent academic organization, was formed in the late 1990s and was created to support students of color as they develop their careers in the accounting field. Since 1998, NABA has helped plan the Bentley Business Bowl, an annual event that brings together students from different programs, majors, and classes to face off with the hopes of winning cash prizes. Other academic organizations on campus include the Investment Group, the Marketing Association, the Speech and Debate Society, the Wall Street Club, and the Entrepreneur Society, among others. Advertisement in the Vanguard for the 1st Bentley Business Bowl on February 28, 1998. The Business Bowl is organized annually by Bentley’s chapter of the National Association of Black Accountants, an organization focused on providing networking and career opportunities to students of color. Bentley Marketing Association in the 1982 yearbook. Today, the BMA is known for events like “Battle of the Orgs,” where members of other student organizations are encouraged to creatively market themselves to win prizes. Members of The Adamian Law Club, ca. 1980s. President Adamian began teaching law at Bentley in the 1950s and throughout his presidency emphasized law education for Bentley students. The Bentley Investment Group in 1999. The group was established in 1997 with a $250,000 grant from the Board of Trustees. They have been responsible for investing and managing this portion of the school’s endowment for the last 20 years. Playbill for Alpha Psi Omega’s production of Joseph and the Amazing Technicolor Dreamcoat in 1988. APO is a national organization, and Bentley’s Chi Iota chapter is known for its annual dramatic productions. The Vale yearbook staff in 1987. Bentley yearbooks were not produced between 1933-1960, but a group of students helped to revive the yearbook in 1961. Since then, the yearbook has been known as “The Beaver,” “Blue and Gold,” and more, but students have always been responsible for its production. Students working at WBTY radio station with a wall of vinyl records behind them, ca. 1980s. The station launched on campus in 1980 and can now be heard online. The earliest known student government began in 1928 as the Student Council. Joseph Wyand, Class of 1929, proposed the idea during his senior year. Their main focus was planning athletic and social events, which included four dances a year and the annual Field Day along with other sporting events – among them, bowling tournaments and basketball games – and entertainment. As Bentley grew as an institution so did the need for more student governance. The responsibilities of planning the entertainment and social events transitioned over to the Campus Activities Board (CAB) along with the Association of Bentley Activities (ABA) while the Student Government Association (SGA) and the Class Councils focus on the needs of the student body and the relationship between the student body and the administration. The Residence Hall Association was also established after Bentley moved to Waltham to support the majority of the students living on campus. The Student Government Association (SGA) in 1992. SGA members communicate student concerns to the university, and help with event planning and organization. The Princeton Review has placed Bentley’s SGA in the Top 10 most active student governments in the nation. The Campus Activities Board (CAB) in 1990. The move to Waltham brought expanded opportunities for student activities, and for many years CAB has planned major events and helped to coordinate others through its executive board and student org handbooks. For most of the first half-century of Bentley’s existence, the school’s only organized sport was candlepin bowling. This reflected its modest roots as primarily a commuter school, but also the limitations of its Back Bay location. Intercollegiate sports were launched in 1962, with basketball, cross country, tennis, golf and skiing. Growth accelerated with the move to Waltham in 1968, which provided the space and facilities for true intramural, club and intercollegiate athletic offerings. The first facility to be constructed was a baseball field, followed by the Dana Athletic Center in 1973. Women’s sports began in 1973-74 with basketball, field hockey and softball. Today Bentley offers a comprehensive array of fitness and competitive opportunities for all students in facilities that are among the best in New England. The first Bentley School Field Day was held in 1918. From what we know, this gives it the distinction of being our oldest school tradition! For the first few decades, Field Day was regularly held at the Riverside Recreation Grounds in nearby Newton, Mass. The area was easily accessible for Bentley’s commuter students, but provided a respite from the noise and crowds of Boston. Students could bring picnic lunches, rent boats, play baseball and tennis, run races, hear live music, and more. Over the years Field Day evolved into Spring Day, a name which may be more familiar to current Falcons. The activities that characterize Spring Day are still largely the same as they were in 1918. Students still run races, play sports, and eat picnic lunches. And of course there is still live music – the Spring Day concert is one of the most highly anticipated events on campus every year! Schedule of events for Field Day, 1922. Our video playlist includes footage of baseball games and races on the Riverside Recreation Grounds in 1950. Students enjoy lunch during the 13th annual Field Day. Photo from 1931 Ben Boo yearbook scrapbook pages. Spring Day activities, ca. 1980s. Club and intramural sports afford recreational and fitness opportunities to all undergraduate and graduate students who want to participate and are a critical part of a comprehensive student experience. Club sports complement full NCAA intercollegiate athletics by offering the opportunity to compete against other colleges and universities at a more participatory level. But club sports can evolve: Bentley’s football team, for example, began as a club team and now competes in Division II. Today students participate in a total of 12 club sports that include triathlon, volleyball, sailing, flag football, basketball, and ultimate Frisbee, and students are always encouraged to start their own intramural sport. Men’s Rugby, 2011. The club team has won two national D3 championships. Bentley Dance Team, 2012. The Dance Team performs at sports games and other campus events, and their Competition Dance Team represents Bentley in national competitions. Dance or aerobics class, ca. 1980’s. Men’s Ultimate Frisbee, 2011. The sport emphasizes fun and fitness while combining elements of several different games. Cheerleading, 1966. The establishment of the sports program at Bentley in the early 1960s created an opportunity for a cheerleading team to organize. Bentley Falcon Cheerleaders, 2013. Bentley cheerleaders now appear at football and basketball games, as well as in national competitions. The first intercollegiate sports at Bentley began in 1962, before the school had its own athletic facilities. By necessity, early varsity teams – basketball, cross-country, golf, skiing, and tennis – organized around sports that were easy to play off-campus. Golf and skiing were already popular recreation activities for students in the Greater Boston area, and basketball games took place on the Boston YMCA courts. After Bentley’s relocation to suburban Waltham, intercollegiate sports began to expand at a rapid pace. The late 1960s and early 1970s saw the formation of our baseball, ice hockey, and football teams, just to name a few. This was also the time that women’s intercollegiate teams, including basketball, softball, and field hockey, began to organize. Today, Bentley has 21 intercollegiate teams, almost all of which compete in NCAA Division II and the Northeast-10 Conference. Many teams have won national championships, and rosters regularly feature nationally recognized scholar-athletes. Bentley’s facilities for varsity sports continue to expand; the 2018 debut of the Multi-Purpose Arena, which will be the new home for the Division I men’s ice hockey team, will bring even more excitement to the athletics program. Member of the Bowling team during a match in the 1950s. True to New England tradition, candlepin was the game of choice for Bentley’s team! Bowling Team members with awards at their annual banquet, ca. 1950s. Football game during the first Homecoming Weekend, 1975. Bentley cheerleaders and the Falcon (not yet known as Flex) during the first Homecoming football game, 1975. Cookout during Homecoming Weekend, 1975. Cross Country runner, ca. 1960s. Men’s Ice Hockey, 1972. This year, the Men’s Ice Hockey team scored a win over Army West Point in the notable Frozen Fenway series. Men’s Basketball, ca. 1970s. After operating as a club team for over 30 years, the men’s varsity team was established in 1963. Men’s Golf, 1978. Golf was one of the first team sports established at Bentley, although students had been playing recreationally since the school opened. Field Hockey, ca. 1980s. The team won the NCAA D2 National Championship in 2001, and has won several NE-10 playoff championships. Volleyball, 1983. The team was established in 1981 and Coach Sandy Hoffman stewarded the team for 31 historic years. Men’s Soccer, 1983. The team has sent many players to the All-Northeast soccer team, and has won several NE-10 conference championships. Women’s Cross Country/Track, 1992. A formal women’s team was not established until the 1980s; since then female athletes have won invitationals and received All-Regional recognition. Softball, 1992. Softball was one of the first women’s sports teams to organize at Bentley, and play began in the early 1970s. Women’s Soccer, 1999. The team formed in 1992 and in 1998 won the NE-10 Tournament Championship. Men’s Lacrosse, 2003. The team won its first NE-10 Championship in 1994, only the second year of the team’s existence! Women’s Tennis, 2006. Men’s and women’s teams did not form until the 1970s, since Bentley did not have any space for courts in Boston! Swimming, 2007. The women’s Swimming & Diving Team consistently achieves high rankings in NE-10 tournaments. Baseball, 2014. The team was established in 1969 and for nearly 50 years has been led by Athletic Director & Coach Bob DeFelice. The field hockey team on the front page of the Vanguard after winning the NCAA Championship in 2001. Women’s Basketball team on the front cover of the Vanguard after winning the NCAA Championship in 2014. The Bentley Student Experience will be on view from April 25th – June 8th in the RSM Art Gallery in the Bentley University Library. You can also view a special video playlist showing student activities throughout the years on the Bentley University YouTube Channel.